regional assemblies - "...Although it has 80,000 trainees in 36 cities, 30,000 graduate members and enormous power, Common Purpose (CP) is largely unknown to the general public. 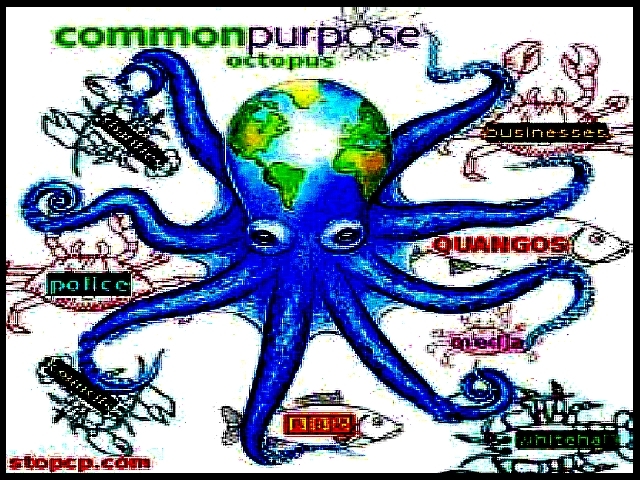 It operates in almost all areas of UK society (as well as other countries around the world) Common Purpose has members in the NHS, BBC, the police, Parliament, the Church (including Bishops) the legal profession, many of Britains 7,000 quangos, local councils, the Civil Service, various levels of government, ministries, many RDAs (Regional Development Agencies), the armed services and also schools and universities. Common Purpose has worked in 10 Downing Street itself. The official founder and Chief Executive of Common Purpose is Julia Middleton who in her profile at the Common Purpose UK Website (www.commonpurpose.org.uk) fails to mention a rather relevant fact: she is also Head of Personnel Selection in the office of John Prescott, the Deputy Prime Minister to Tony Blair. Prescott has been the man with responsibility for creating 'regional assemblies' around the United Kingdom which are part of the plan to abolish nations and bring their powerless 'regions' under the jackboot of the European Union. He has, of course, sought to sell this policy as 'devolving power to the people'...Common Purpose UK operates under Chatham House Rule: "When a meeting, or part thereof, is held under the Chatham House Rule, participants are free to use the information received, but neither the identity nor the affiliation of the speaker(s), nor that of any other participant, may be revealed." This is a very odd thing for a charity to do..." (words).